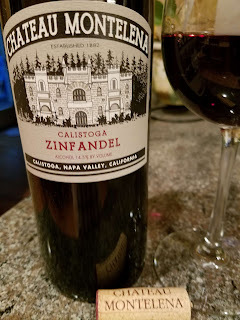 A Summer Red: Chateau Montelena Winery 2014 Calistoga Zinfandel? I suspect, like me, most of you associate Napa's Chateau Montelena Winery with their Judgment of Paris Chardonnay or their Cabernet Sauvignon. And rightfully so since these are consistently excellent wines. But even with a visit to the winery many years ago, Chateau Montelena's other wine varietals never became ingrained in memory. 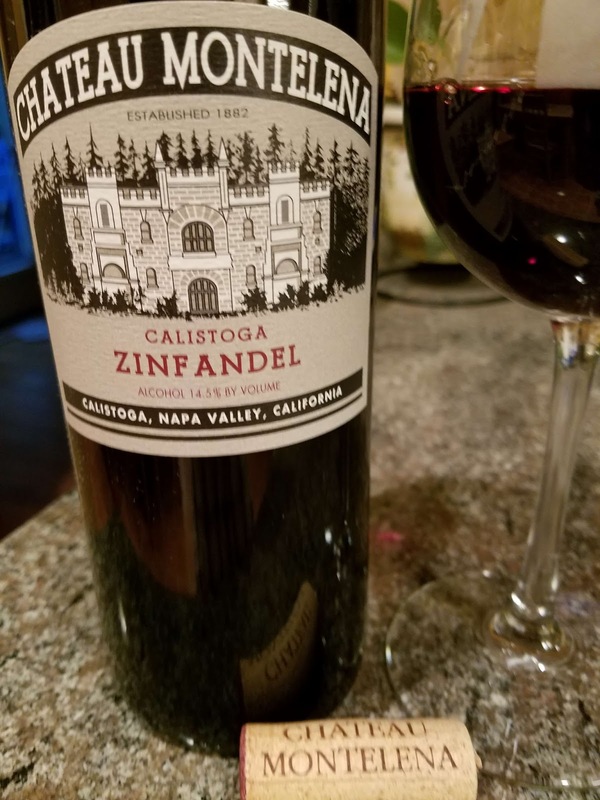 That changed when I received a sample of their 2014 Calistoga Zinfandel ($29). The marketing sheet exclaimed that this was "the wine you should be drinking on the beach this summer" and my initial reaction was right, I bet. Lodi and Paso perhaps, but from Napa - nah. According to winemaker Matt Crafton, the Chateau Montelena Zinfandel is "re-invented" each year and the noticeable aspect is that the fermented Zinfandel was aged in a combination of French, American, and Irish oak casks - the first time this later oak treatment has been used in California in over a century. Also noticeable is that the grapes used were a combination of old-vine Zinfandel from the Tofanelli Ranch and new plantings of estate Primitivo. And the wine is made in the rustic Italian style, lighter in color and fruit, but complex with notes of earthy dirt, tobacco, cinnamon, and cherries. The finish is very smooth with approachable tannins and light pepper and chocolate. Thus, this wine is ready for a summer BBQ or an evening sip on the deck. The Chateau Montelena Zinfandel deserves respect alongside their more accomplished Chardonnay and Cabernet. Cheers. 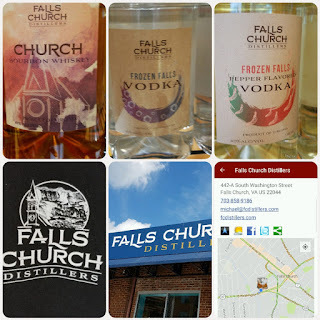 Loudoun Welcomes Two More Breweries to the "Dulles Corridor"
With the opening of two more breweries this summer, Virginia's Loudoun County now has 23 breweries with eight forming a pseudo beer trail that I labelled the Dulles Corridor. The trail starts on the east with contract brewer Beltway Brewing Company and the new Sterling location for Crooked Run Brewing. Before this new location Crooked Run had utilized Beltway's services, but now they have their own capacity to brew excellent beers such as the Cruise Control Pilsner or the Dulce De Leche Imperial Milk Stout. 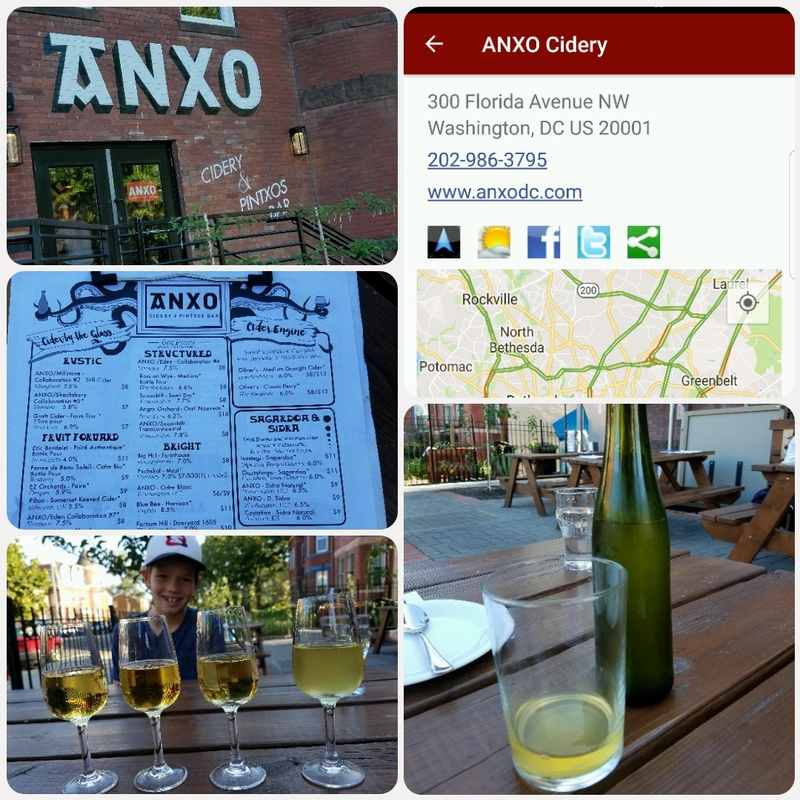 As for Beltway, they have a couple of their own recipes, but the incentive to visit is driven by tasting beers brewed for other markets such as New York's Grimm Artisanal Ales or Georgia's Brackish Beer Company. Twinpanzee Brewing Co. forms the center of this beer trail as the new brewery celebrated their Grand Opening this past Saturday. 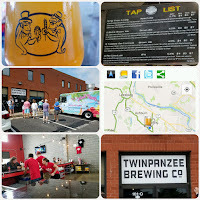 Waves of beer lovers arrived throughout the day enjoying four beers on tap, food trucks, and a ribbon cutting ceremony with Loudoun officials. As I savored their Coconut Brown Ale I was left wondering why Fairfax County alienates brewery entrepreneurs while Loudoun County welcomes them. Not far down Old Ox Road lies the very consistent Ocelot Brewing Company. Beer lovers can always expect a large array of craft beers from a few IPAs to lagers and sours. During my last visit I went the low abv route with the 5.6% Craft AF Lager - a collaboration with Breiss Malting, a Wisconsin malting company. A very European beer. But if you love IPAs, then this is your spot as of August 12th there were seven on tap. 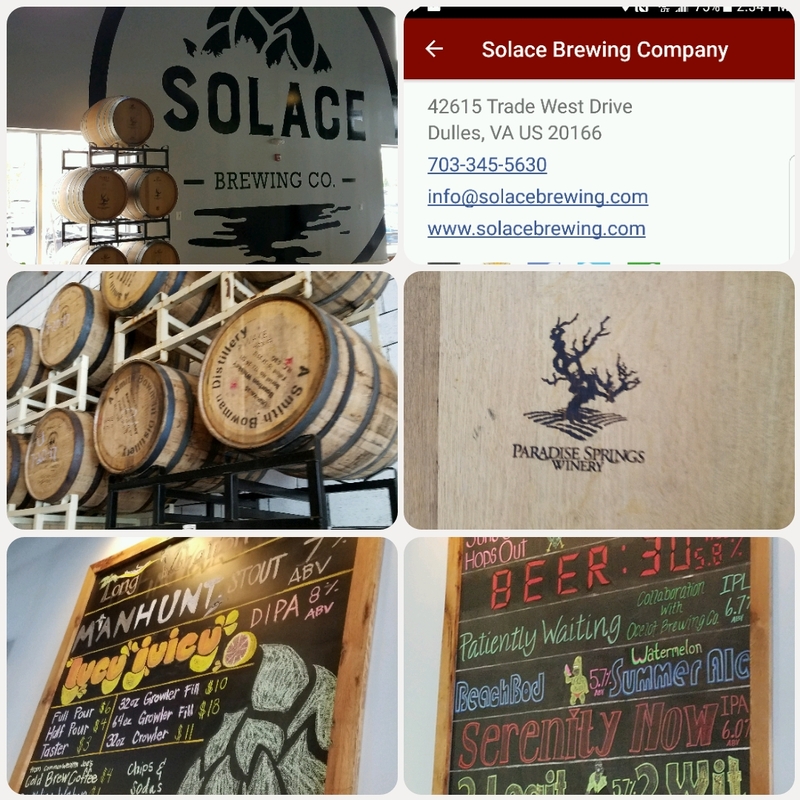 Solace Brewing Company is the other newly opened brewery founded by entrepreneurs who met and gained valuable experience working at Beltway Brewing. 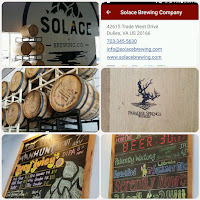 When opening Solace they planned big regarding the tasting room, production equipment, and portfolio. There's plenty of room indoors and out to enjoy a plethora of craft beer styles. Once again I stayed low abv with the Sun’s Out Hops Out Session IPA, 2 Legit 2 Wit, and BeachBod Watermelon Summer Ale. The later makes a great beach beer, with just a slight watermelon character. And my beer drinking partner was all about the Patiently Waiting IPL collaboration with Ocelot Brewing. Lost Rhino Retreat sets the western boundary to the trail and sadly I've yet to visit despite the fact that I've visited the original Lost Rhino Brewing Co. Ashburn location more than any other brewery. 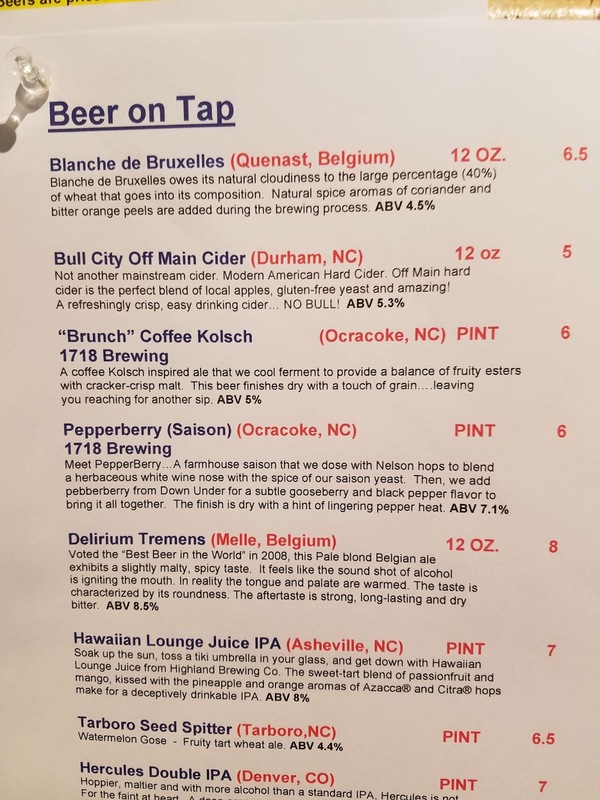 In addition to the expanded food menu there are more beer options as well including some brewed just at the Brambleton location, collaborations, and guest taps. And either location will have the Virginia Craft Gold Medal for Czech Lager Rhino Chasers. 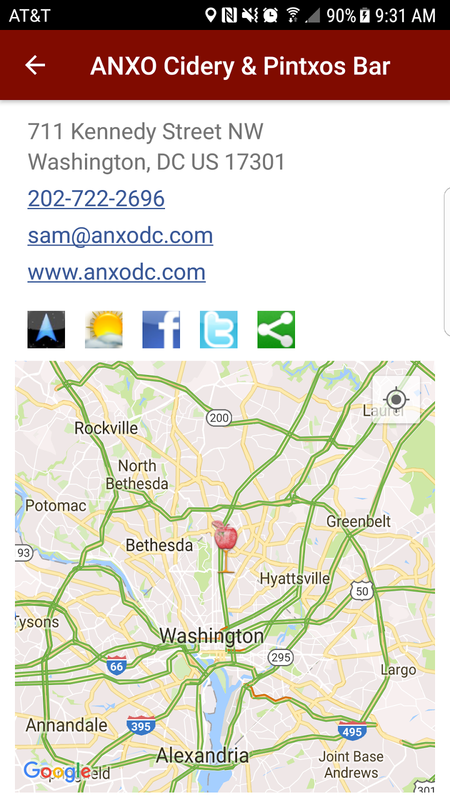 Also establishing the northern boundary with Lost Rhino Ashburn is award winning and WO&D Trail favorite Old Ox Brewery. The last time I visited was during a rain soaked ride over Memorial Weekend in order to purchase bombers of their Funky Face sour. I don't visit as often since their core lineup of Virginia Craft Gold Medal Black Ox Porter, Alpha Ox Pale Ale, and Golden Ox Ale are well established in area restaurants and beer stores. 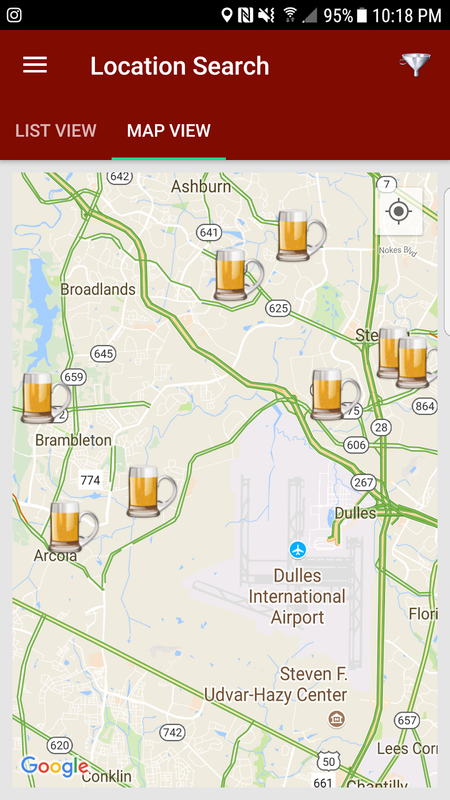 And as always, theCompass Craft Beverage Finder will guide you to these breweries. Cheers. It is a popular concept for craft beverage makers to open satellite tasting rooms in popular tourist destinations with one of these being Myrtle Beach, South Carolina. Recently Duplin Winery opened a facility in North Myrtle following the success of Palmetto Moonshine three years ago south of town. 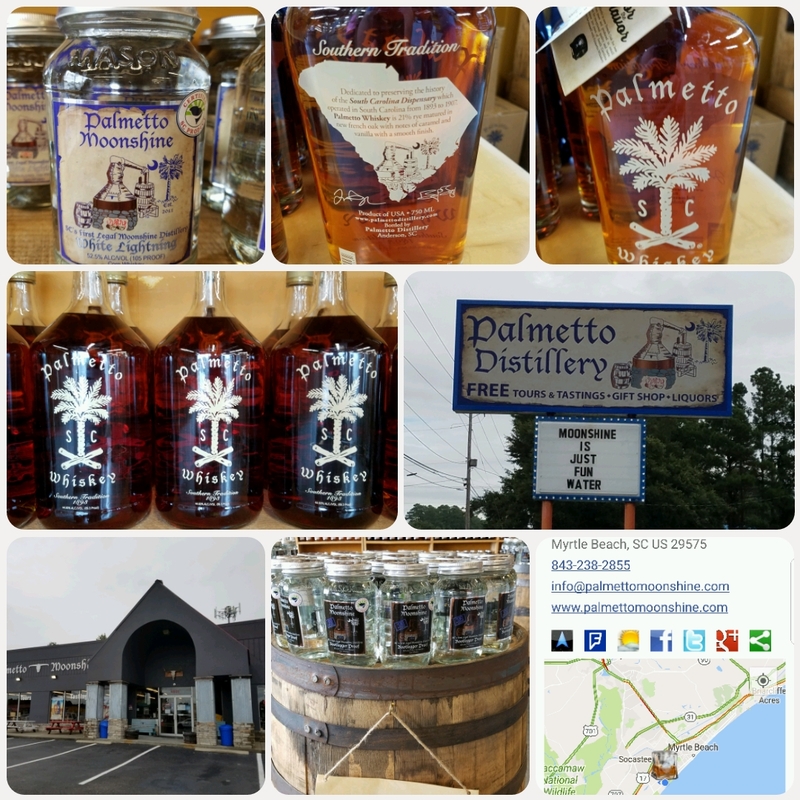 Brothers Trey and Bryan Boggs have been instrumental in the growing craft spirits market by first crafting the Palmetto State's first legal moonshine and then by leveraging the larger seashore tourism market to expand distribution. The distillery's spirits are still produced in their original Anderson location, but the original still is now a water fountain in Myrtle. A $5 tasting fee provides samples of their White Lightning Moonshine, four flavored shines, and the Palmetto Whiskey ($35, 88.3 Proof). Starting with the whiskey, it was a pleasant surprise, with combinations of spice, caramel, vanilla, and finishing with a slight burn. This complexity starts with the mash bill of 21% rye and 51% corn and malted barley with additional flavors from aging less than two years in new French oak. The unique bottle honors the South Carolina Dispensary, a state controlled monopoly on liquor sales in South Carolina which operated from 1893-1915. The Dispensary employed glass makers and craftsmen that created bottles unique to the Palmetto State and what many consider to be works of art. The bottles being produced from 1893-1900 featured an embossed palmetto tree with crossed logs under the base of the trunk. A nice addition to the bar or a gift. The various moonshines were also tasty, starting with the flagship Palmetto Moonshine White Lightning ($29, 105 proof). 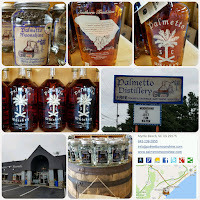 The Palmetto Moonshine is an "un-aged corn whiskey made from a recipe handed down from generations of moonshiners and produced using our custom copper still built by a 5th generation moonshiner". It is smooth even at this high alcohol level with traces of sweet corn. The flavored shines are all $29 and cut to 45 proof with local fruit juices. The Peach and Strawberry were our favorites as the Blackberry and Apple were too jammy and sweet for our tastes.I'd much rather return home with one of these than a lousy T-shirt. 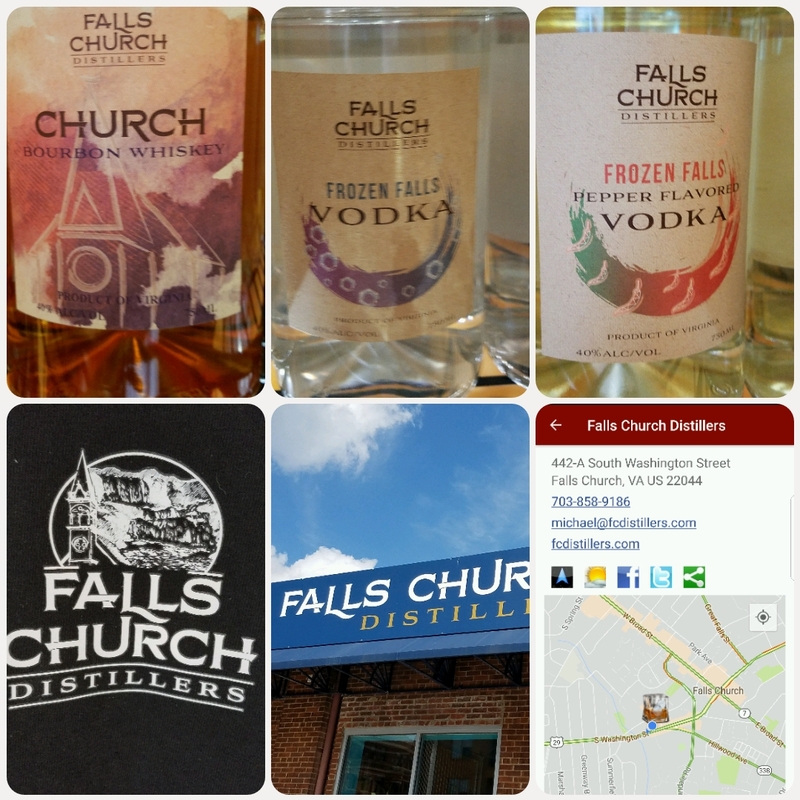 Cheers and as always theCompass Craft Beverage Finder will guide you to these destinations. I've learned over the years that Paso Robles is not only the 3rd largest wine region in California but one of the most diverse. Red wine is king with Cabernet Sauvignon accounting for almost 40% of overall grape harvests. That grape and other red Bordeaux grapes are promoted through the Paso Robles CAB Collective. Syrah and Zinfandel are also major players in the region as is the Other Red category which consists of Petite Sirah, Cabernet Franc, Grenache, Mourvedre, and Petit Verdot. As for white wine grapes, Chardonnay is the most widely planted grape at 5%, followed by Other Whites also at 5% and Sauvignon Blanc at 2%. 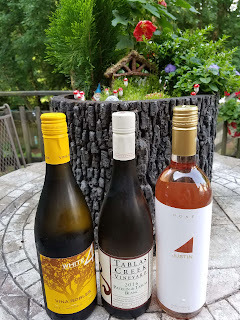 To help promote these lesser known white wines, the Paso Robles Wine Country Alliance initiated the #UnexpectedPaso Twitter tasting sending several white and rosé wines to various wine bloggers. After I receive wine from these tastings I usually pass the leftovers among the neighborhood. And this was one time my discriminating neighbors agreed: the wines were excellent. JUSTIN 2016 Rosé ($22.50) is made from 100% gently pressed Cabernet Sauvignon. The wine is quite refreshing with layered flavors of strawberries and tart cherries. Vina Robles 2016 White 4 ($16) is a blend of 45% Viognier, 27% Vermentino, 17% Sauvignon Blanc, and 11% Verdelho. Its starts with plenty of aromatic stone fruit which continues onto the palate mingling with tart grapefruit. This is one savory wine. Tablas Creek Vineyard 2016 Patelin de Tablas Blanc ($27) is a blend of five white grape varieties (Grenache Blanc, Viognier, Roussanne, Marsanne and Clairette Blanche). The fruit was sourced from nine Paso Rhone vineyards, whole clustered pressed and fermented with native yeasts. This was the most mineral driven wine interspersed with creamy stone fruit and lemons. My favorite of the group. 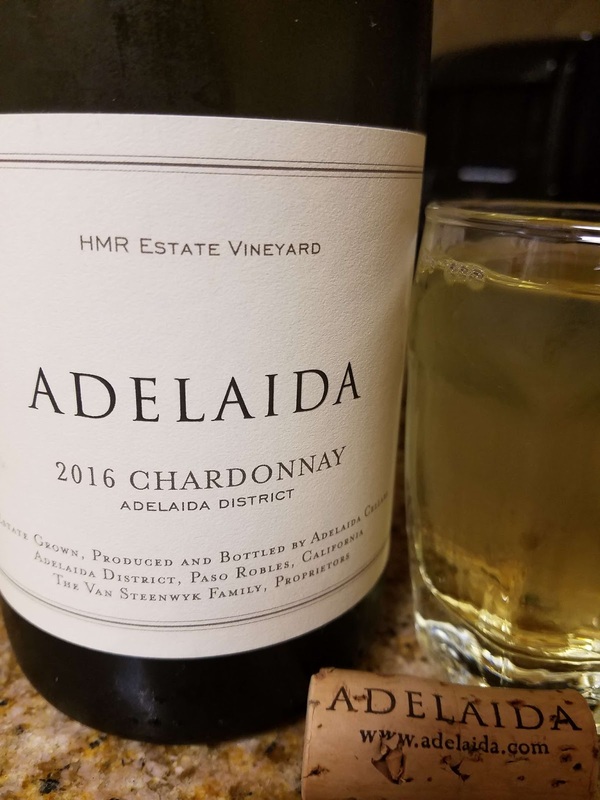 Adelaida Cellars 2015 HMR Chardonnay ($40) is made from grapes grown in the cooler hillside terrain of Paso Robles' Adelaida District, 14 miles from the Pacific coast and ranging from 1400 - 2000 feet above sea level. The fermented wine was aged nine months and various forms of oak which provides lift and complexity without the awful over the top buttery character. In fact, the expected lemon zest Chardonnay flavors are prominent, along with a creamy texture, and refreshing acids. Nicely done. 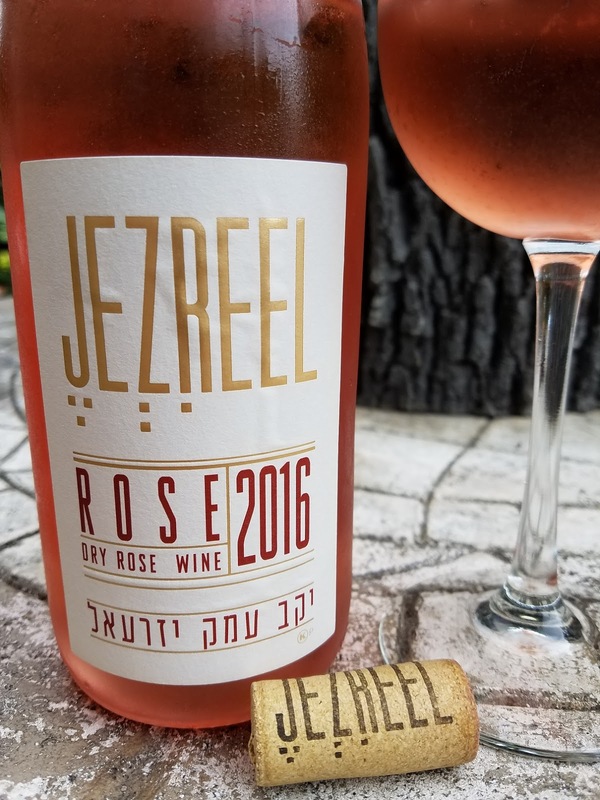 Middle Eastern wine is slowly finding a home in the U.S. market and another entering the market is Israeli Jezreel Valley Winery. The winery was founded by winemaker Yuehuda Nahar and Jacob Ner David and is situated in Kibbuz Hannaton, approximately 35 kilometers west of Haifa. The winery currently produces six wines using both international and indigenous grapes - the later being Argaman, a cross between Souzão and Carignan. 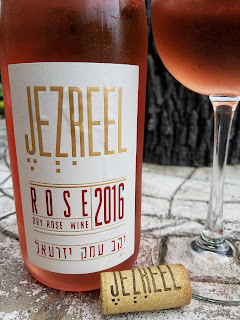 The Royal Wine Corporation just added some of these wines to their kosher inventory and I recently received a sample of the Jezreel 2016 Dry Rosé ($22), a blend of Syrah, Carignan, Argaman, and French Colombard. Each grape varietal was slow cold fermented separately with little extraction. This is a fresh wine, plenty of refreshing acidity, but unfortunately not much to show in terms of aroma and flavor. Prefer others. I remember the days when Ocracoke Island was dry as Hyde County outlawed sales of any craft beverage. Over time this barrier island in the Outer Banks of North Carolina slowly received it's alcohol liberation as the county slowly allowed the sale of beer and wine and eventually liquor. 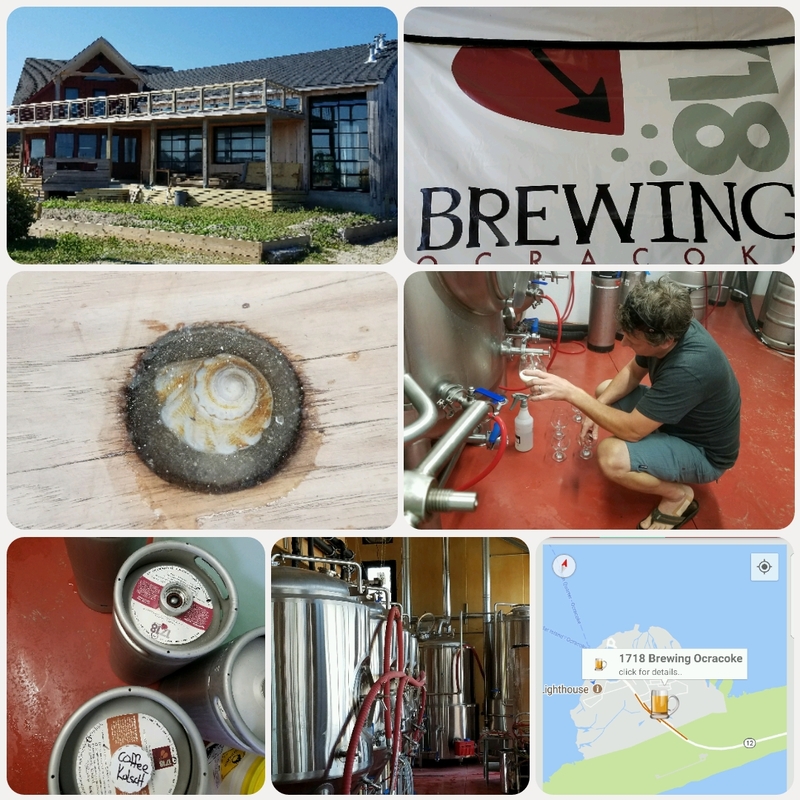 During the transition from dry to wet county, Garrick Kalna and his soon to be wife Jacqui arrived on the island and design a three year plan to open a micro-brewery on the island. Garrick had brewed domestically and commercially in Colorado throughout his college years. The plan's initial phase included opening the very successful Ocracoke Coffee Co. So successful, the plan was extended 18 years until they sold the coffee shop in 2012 and laid the foundation for 1718 Brewing Ocracoke by purchasing the former Atlantic Cafe next to Howard's Pub. It was still a long process. Last year during our annual visit to the island we noticed the brewery being built out with the tanks visibly from the road. And this year we saw progress from the outside but wasn't sure if 1718 Brewing was operating until we hit Zillies Island Pantry where their Pepperberry Saison and Coffee Kolsch were on tap. The first round was purely investigative whereas the next few were because these beers were excellent. The Coffee Kolsch was a complete eye-opener regarding the style and completely surprised on it's refreshing character. The Pepperberry exudes spices, I'm not sure what the pepperberry provides, but the beer hit all the Saison characters. The next day we setup a private brewery tour where Garrick interrupted a day of brewing and construction to give our large group a tour and a taste of his Good Bones IPA a New England inspired IPA which translates to a balanced use of hops. While sipping, Garrick provided a brief history of his background, which included volunteering at the Outer Banks Brewing Station, plus an overview of the brewing operation, regulations, and his IPA centric focus. While answering our questions it became readily apparent that Garrick is not only a self described water geek, but also an expert on yeast cultures. Expect some interesting craft beer coming from 1718 Brewing and for those unfamiliar, the brewery's name and banner reflect the island's Blackbeard culture: the year he was captured and killed and Blackbeard's flag. With the current disaster caused by the Oregon Inlet construction, local businesses will need your assistance once tourists are allowed back onto Hatteras and Ocracoke. theCompass Craft Beverage Finder will guide you to Ocracoke's first brewery. Cheers. 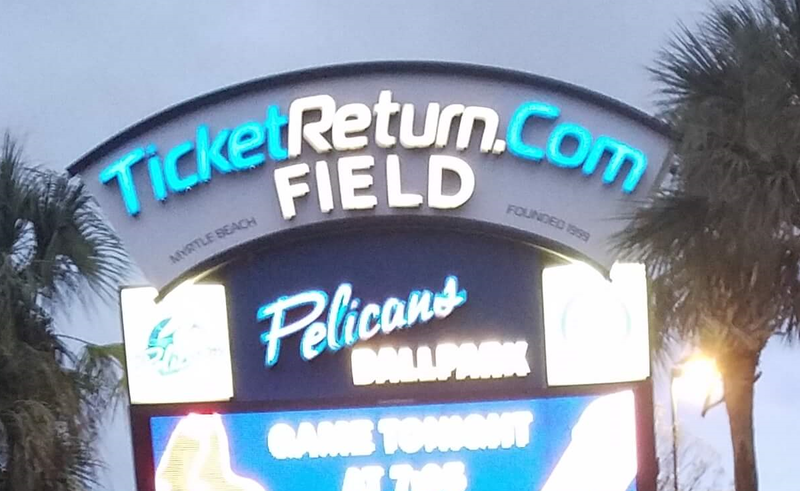 Don't get excited about finding craft beer at TicketReturn.Com Field for the Myrtle Beach Pelicans minor league baseball. The Pelicans are a Cubs single A affiliate and seem to an exclusive beverage contract with Inbev. Sadly, its the low end Budweiser products Bud, Bud Light, and Mich Ultra that dominated the concession stands. 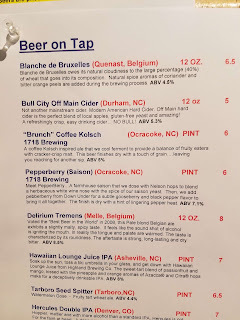 I did see one Foothills Brewing tap handle for their Carolina Blonde but that tap was pouring Bud Light. As for wine, the stadium was well stocked with the sweeter side of muscadine based Duplin Winery that has a satellite tasting room in Myrtle in additional to their North Carolina location. The Sangria is probably your best bet.